countries, held in the House of Commons, Parliament of Canada in Ottawa, Dec. 9, 2013. Congratulations for having this hearing today, especially as the world this week honours Nelson Mandela, one of the greatest advocates of dignity and equality for all human beings. Naming and shaming several governments today will at least make some who persecute faith communities uncomfortable, and might encourage those who seek religious freedom across the world as promised by U.N. and other international instruments. I’m delighted that spokespersons will speak today about major religious liberty problems in Iran, Pakistan and Egypt. For time reasons, these comments will relate to China only. My respect and affection for the Chinese people is longstanding. It grew during several visits to the country and in meetings with members of the vast Chinese Diaspora. It is no accident that more than one million Canadians of origin in the Middle Kingdom are now our most-educated cultural community. It was an honour to represent some of them in our Parliament for almost twenty-seven years. Two years ago, educator Jan Harvey of Vancouver and I wrote about persecution of faith communities across China in the preview issue of Convivium magazine, published by Canadian Catholics. Another piece was written this month by Geoffrey Johnston in Kingston’s Whig Standard newspaper. • Freedom of religion, faith, conscience, and belief, guaranteed under the UN Universal Declaration of Human Rights, has not discouraged China’s communist overlords from establishing a system that oppresses and brutalizes people of faith. • When Communists seized control of China in 1949, the new regime established state bodies to oversee religion. The regime also founded state-controlled national Catholic and Protestant churches, which ordain and control clergy. All Chinese Christians are required to register with either of the official state-sanctioned churches. • “While an increasing number of unregistered churches in China are able to operate with greater freedom than before, there continue to be cases of arrest, disappearance, harassment and confiscation of property among their members,” says Kiri Kankhwende, a spokesperson for Christian Solidarity Worldwide (CSW). “In areas like Xinjiang, where citizens typically face more restrictions on their civil and political rights, even registered religious activities by Muslims, Catholics, and Protestants are closely monitored and often restricted,”(she) says. • “Apart from the repression of Christian churches, the government is guilty of severe repression of Tibetan Buddhism in Tibetan areas of China; and a brutal clampdown on Muslims in Xinjiang Uyghur Autonomous Region,” says Amnesty International Canada’s Michael Craig. • “Although China is a signatory to the International Covenant on Civil and Political Rights, which guarantees freedom of religion or belief, it has not yet ratified it,” says Kankhwende. “The Chinese government should be encouraged to ratify the Convention and to ensure that officials in central and local government, as well as law enforcement officials, are adequately trained to protect and promote freedom of religion of belief for all, in line with its own constitution and its obligations under international law,” (she) says. • When it comes to defending human rights and religious liberty, Swett thinks America needs “to be a little bolder, a little braver” in its dealings with Beijing. “We need to have a little more steel in our spine when it comes to advocating for these very important causes.” “The same could also now be said of Canada,” concludes Johnston’s piece. 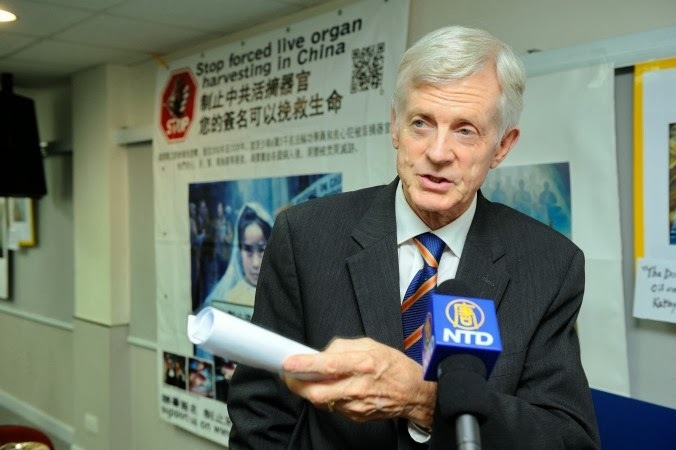 David Matas and I concluded that 41, 500 organs from Falun Gong prisoners of conscience were trafficked in the years between 2001 and 2005 alone. The appalling commerce continues today. Matas and I visited about a dozen countries to interview Falun Gong practitioners, who managed to leave both the camps and the country. They told us of working in appalling conditions for up to sixteen hours daily with no pay and little food, crowded sleeping conditions and torture. Inmates made a range of export products, including Christmas decorations, for multinational companies. This constitutes both corporate irresponsibility and a violation of WTO rules and calls for an effective response by all trading partners of China. Our governments should ban forced labour exports by enacting legislation which places an onus on importers to prove their goods are not made in effect by slaves. In the 2012 book State Organs, writer/researcher Ethan Gutmann estimates that 65,000 Falun Gong were killed for their organs during the years 2000-2008, selected from about 1.2 million of them interned in China’s forced labour system. In 2007, a U.S. government report estimated that at least half of the inmates in 340 such camps were Falun Gong. Leninist governance and “anything is permitted” economics encourage organ trafficking to continue across China. The Party uses force to suppress voices that advocate religious freedom in China. One is Gao Zhisheng, a twice Nobel Peace Prize-nominated lawyer in the tradition of Nelson Mandela and Mahatma Gandhi. A decade ago, Gao was named one of China’s top ten lawyers by its Ministry of Justice. The Party a released its full wrath, however, when Gao, a Christian, decided to defend Falun Gong practitioners. The suppression began with the removal of his permit to practice law, followed by an attempt on his life, a police attack on his wife and two children, and denying the family any income. It intensified when Gao responded in the nonviolent tradition of Gandhi by launching nationwide hunger strikes calling for equal dignity for all Chinese nationals. In one of his articles, he described more than 50 days of torture in prison. In 2009, his wife, Geng He, their 16-year-old daughter and 6-year-old son escaped China and reached the United States, seeking asylum. He remains in prison. I’m delighted to add that Canada’s religious freedom ambassador, Andrew Bennett, today said that he’s deeply troubled by the Chinese party-state’s “egregious” treatment of religious communities, specifying “unacceptable” treatment of Falun Gong practitioners as well as Buddhist Tibetans, Uyghur Muslims and Christians. The international community should remain engaged with Beijing despite the constant difficulties created by its governance model. The Chinese people should know that Canadians stand with them, not with their government, just as we did in central Europe during the cold war, and with South Africans, particularly during the late ‘80s and in the lead-up to the election of Nelson Mandela. The world’s democrats, including our national governments, civil society institutions and businesses, should, of course, remain engaged with the new government in Beijing and the broadest possible range of citizens across China despite the difficulties created by autocratic governance. Democracy with very Chinese features is probably closer than many think. How many ‘experts’ anticipated the fall of European totalitarianism in 1989 or the Arab Spring more recently? No one on the democratic side should forget in this engagement that the values we represent are universal ones, including human dignity, the rule of law, multi-party democracy, corporate social responsibility, and the need for people everywhere to have access to good jobs. The Chinese people want the same things as the rest of us, religious freedom, respect for all, education, safety and security, good jobs, the rule of law, democratic and accountable governance, and a sustainable natural environment. If the party-state ends its systematic and gross violations of human rights at home, especially in respect of Falun Gong practitioners, and abroad and begins to treat its trade partners in a transparent and equitable way, the new century can bring harmony and coherence for China and the world. The first step in a better direction is to end organ pillaging now.